It has been raining heavily all over Auckland over the weekend of March 11th and 12th. This picture was found on the Facebook page of Massey, and taken by a Claire Shiels. Hopefully they do not mind us using the photo. . Advertisers Welcome! Please contact John - phone 833 6972 or 0274 779 750 to arrange a text advert that appears after the article. Reach your local community from $25. The Massey & Birdwood Settlers Association always welcomes new members. 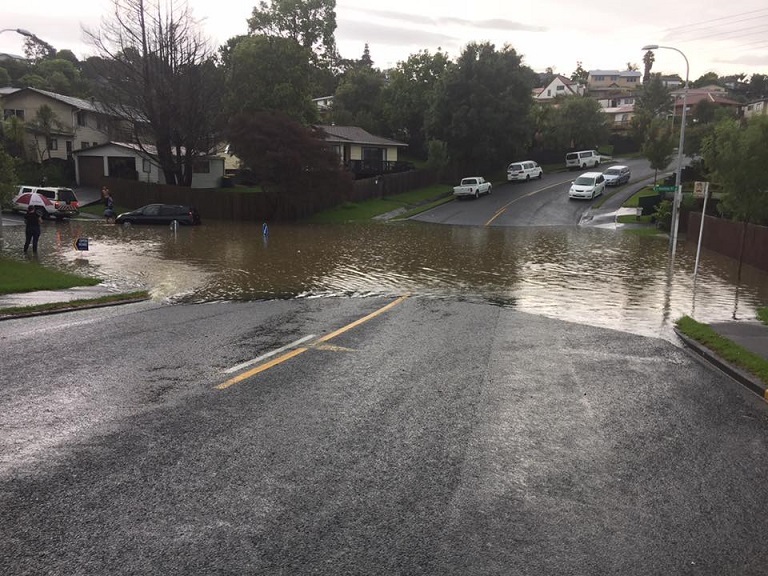 As a resident and ratepayer group we represent the views of the community to the local Council and Government, ensuring adequate resources are spent in the community that will benefit the whole community. Petrol Prices…It seems to be at least 3 cents dearer than other areas where they pay $2.01 for a litre of 91 we pay $2.04. 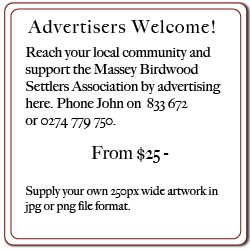 Reach your local community and support the Massey Birdwood Settlers Association with a text advert with link in this sidebar. From $25 - Phone John 833 6972 or 0274 779 750 to discuss options. To join us, or just ask us a question, us email masseybirdwood @ gmail.com . The Massey Birdwood Settlers Association meets on the last Thursday of every month The Lion’s Den, Massey Birdwood Settlers Hall, Don Buck Road. Come join us and make your views known.